Grocery Shopping when Hungry? Yes, I know, I always preach my followers to enter the grocery store after your meals and look here what I did. I happily went ahead on an empty stomach to fill my kitchen pantry and refrigerator. By now you must have guessed that not only my pantries got overloaded but my budget also went overboard. When I sautéed purple kale in warm oil it started to change its color to extremely bright, shiny and aromatic green color. When I seasoned it with salt and black pepper and added some vegetable broth the soup was thicker and creamier and so much more inviting than regular green baby kale. Lastly, I added whole grain, high protein and fiber rich, good carbohydrate and one of my favorite ancient grains – Bulgur in the soup, to make it a complete meal. Slurp! Slurp! Slurp! Was the only sound around me and I could hear myself relishing this dinner. A bowl of warm Kale Bulgur Soup on a cold wintery night after the ‘expensive’ shopping was extremely satisfying and blissful. Heat oil in a pan and sauté kale in it for a minute or till it start to release water. Purple kale will change its color to bright dark green and will become shiny and aromatic. Add vegetable broth to it and boil for couple of minutes. Turn off the flame and let it cool. Once cooled blend it very smooth. The color will change to dark green and will have a creamy texture. Pour the soup again in the same pan and warm it. Add salt, pepper and coconut milk and boil for couple of minutes. Lastly, add cooked bulgur and mix. 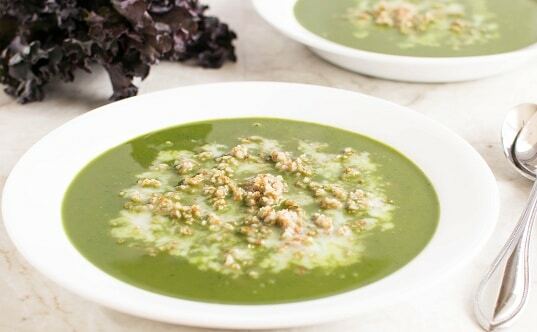 Serve this soup warm in soup bowls and enjoy. Purple kale changes its color to green when cooked. It has a nice creamy texture and sweeter in flavor. If you use purple kale the soup will have a thicker consistency. If you plan to use regular green baby kale the taste might change slightly and the consistency would be thinner. In this case add a pinch of sugar.